New Air Asia seat sale for 2016 to 2017 are now up for grabs! To our readers who are looking for 2017 promos, check ASAP the new Air Asia promo fare tickets, and BOOK FAST! On sale from today until November 13, 2016 are Air Asia low fares that cover flights from November 1, 2016 to October 15, 2017. Yes, promo tickets on this sale can be used for trips for almost a year. This means, you have time to save for other travel expenses. Domestic Air Asia promo is as low as P1,058 while sale international flights can be booked for as low as P1,488 ALL IN one-way fare. Air Asia promo seats are limited and may not be available on all flights. 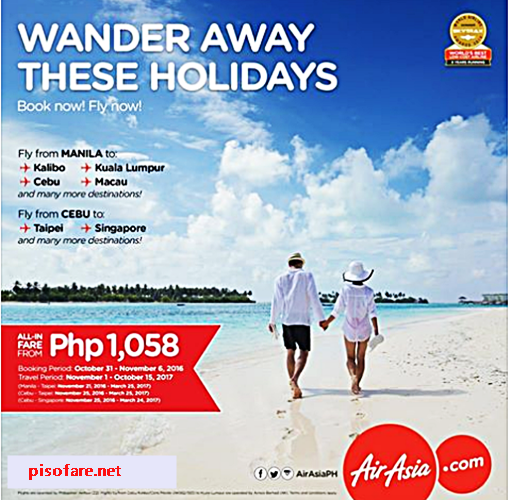 Avail the Air Asia promo at the airline website: www.airasia.com. To get the most for your vacation, you may book your travel during the holidays and long weekends in 2017. Read this POST for the list of long weekends. Air Asia cheap tickets include airport taxes except for selected airports where airport tax is collected at the point of departure. You may purchase your Air Asia ticket online even if you do not have a credit card or ATM card. Click HERE on how to pay your tickets without using a credit card. For inquiries, please contact Air Asia hotline number: (63-2) 722 2742 between 7AM-11PM, Monday to Sunday. Guests need to provide the required travel documents like a valid passport, Visa for international travel or a valid ID for local trips. Changes to names are not allowed. Changes to flights and dates are permitted with corresponding fees. For more promo fares, PISO FARE from airlines: Air Asia, Cebu Pacific Air, Philippine Airlines, Skyjet as well as travel updates LIKE and FOLLOW us in Facebook at PISO FARE TICKETS!! !